Galaxy S8 and the Galaxy S8+ Plus are upcoming flagship smartphones from Samsung. These two phones are the best Galaxy phones ever with infinity screen, an iris scanner, and on-screen navigation buttons. With the launch of Galaxy S8 Samsung has bid farewell to the hardware navigation buttons. We may not see the physical buttons in the upcoming Samsung Galaxy flagships. The Galaxy S8 also comes with massive 64 GB internal storage which can be further upgraded to 256 GB via a microSD card. So you can see there is lots of storage available on the Galaxy S8 smartphones. If you are a photoholic then the internal storage may soon run out because the camera is capable of taking high-quality images and 4K videos. 4K videos and high-resolution photos take up a good amount of storage space on your phone. So, if you run out of space on your phone then you should move them to PC by using an OTG drive. But this method is not the best one because when you are dealing with a large amount of data then you may face problems because of duplicate files. So it would be difficult to find the duplicate files and delete. The above problem applies to video and audio files. Nobody wants duplicate files because they waste the storage space. So managing the data on your Galaxy S8 is extremely necessary when you have a large amount of data. To manage such large data you should use an android manager software. An android manager is a software that allows you to manage all the data stored on your Galaxy S8's internal storage and microSD card. An android manager can let you manage every single bit of user accessible data that other software applications fail to manage. With an android manager, you can manage your photos, videos, music files, contacts, call logs, calendars, apps, SMS messages, and android apps data. Such an android manager is Wondershare TunesGo which is currently the best android manager for Samsung Galaxy S8. Wondershare TunesGo is an android manager that lets you manage your data stored on your Galaxy S8 or any other android smartphone. With this software you can copy your personal data from phone's internal storage and external storage to PC or can also transfer to other android phone. With this software you can manage all the data at just one place. What Can Wondershare TunesGo Do for You? Wondershare TunesGo is a smart android manager software that is available to download for Mac OS and Microsoft Windows. This software runs on your PC and lets you manage your Samsung Galaxy S8 data easily at a single place. It provides following functions listed below. Manage photos stored on your phone microSD card. Manage videos stored on the phone and microSD card. Manage contacts, add new contacts, delete or take backups (Windows version only). Backup calls logs and SMS messages. Uninstall or backup android apps and their data. Take entire backup of your data stored on the phone in just one click. This backup includes photos, videos, messages, contacts, call logs, music, calendars, android apps and their app data. Restore data from previously taken backups. Root your android phone in just one click. Transfer data from one android phone to another with the phone to phone transfer feature. Transfer iTunes media to your android device. 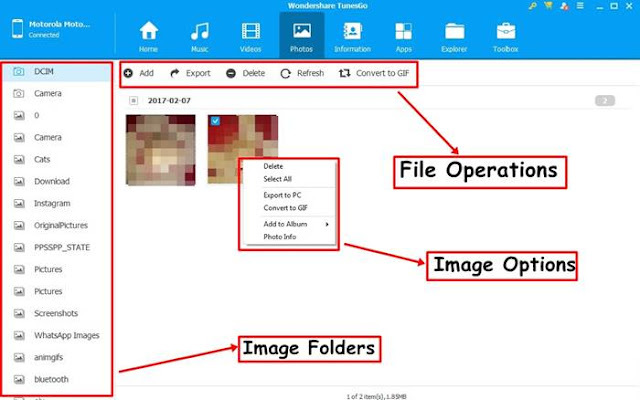 Use the inbuilt file explorer to explore the internal and external storage (Windows version only). Make ringtones from a song, audio or music file. Make GIF from photos and videos. Capture screenshots (Windows version only). Lets talk about the main functions of the Wondershare TunesGo. First of all you have to download the software from their official website the link has been given above. After downloading install the software on your PC. After installation launch the program and connect your Galaxy S8 to PC via USB cable. Make sure that you have enabled 'USB Debugging' in 'Developer options'. On connecting to your phone to PC your phone will show a popup asking you to grant access over USB. Tap 'OK' to proceed. After granting access a successful connection will be established between your phone and the TunesGo software. Now we are ready to manage the data. After making the successful connection you will see a screen like this below. There are four main functions on the home screen. These functions are 'Rebuild iTunes Library', 'Transfer iTunes Media to Device', 'Backup Photos to PC', and 'Phone to Phone Transfer'. Lets see what these functions do. 1. Rebuild iTunes Library: Suppose your PC/Mac got crashed and some files from iTunes got deleted, Wondershare TunesGo can rebuild your entire iTunes library from Android device quickly. It allows you transfer Android media and playlists to iTunes. The good thing is that it will automatically detect the missing media files and copy them from your android phone without making any duplicates. 2. Transfer iTunes Media to Device: This function transfer the iTunes media to android phones with just one click. 3. Backup Photos to PC: This is the shortcut to take the entire backup all photos stored on your Galaxy S8's internal storage and SD card. The backup can be stored on PC's hard drive. 4. Phone to Phone Transfer: If you want to transfer your data to a new android phone then use this feature to move data to a new phone. To use this function you have to connect two phones to your PC. 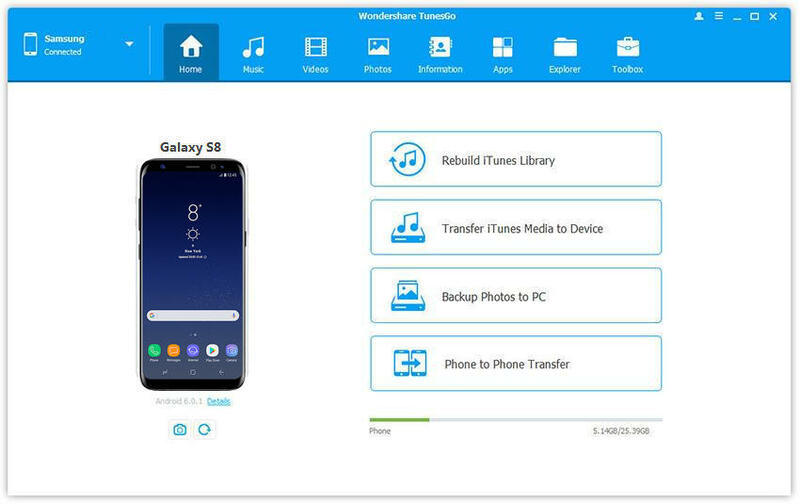 Wondershare TunesGo is the best android manager for Samsung Galaxy S8 and with this software it is easy to manage photos and videos. Photos and videos are the most common type of data that you come across more frequently on your Galaxy S8. So, it is necessary to have them managed. So first of all connect your Galaxy S8 to PC and launch the Wondershare TunesGo. Then head over to the 'Photos' section. Here you can manage all the photos stored on your phone's internal storage and microSD card. You can transfer them to PC, rename them, delete them, add new photos, and convert them to GIF. On the left panel you access the directories of the photos from internal and external storage. It is quite easy to use. The same way you can manage videos. With Wondershare TunesGo it is easy to manage your contacts. You can export your contacts to a CSV, or a vCard file. You can also import contacts from a vCard, CSV file or from Outlook or Windows address book. You can merge, delete or add new contacts from the software to your Galaxy S8. This is one of the useful features of Wondershare TunesGo. With this you can backup your music stored on your Galaxy S8. You get managing options like add, delete, de-duplicate and export. The de-duplicate function lets you identify duplicate songs and allows you to remove them to save storage space. The other best feature includes a ringtone maker. You can make a ringtone from any music file or song that you see in this software. The ringtone length is 40 seconds or less and you can select any 40 second part of a particular song to make a ringtone. The ringtone is created with a fade in and fade out effect which is essential for ringtones. To manage android apps installed on your Galaxy S8, head over to the 'Apps' section. Here you will find options like install, uninstall, and export. With the install function you can use an apk package to install it from your PC to your phone. Export function will backup your android apps to PC as apk files. You can use the Wondershare TunesGo file manager to manage files on your phone's internal storage and SD card. This file manager also shows hidden files. You can add or delete files from PC to phone. You can also add a folder or export individual files or folders to PC. The Toolbox contains the necessary functions all at one place. The one-click root option can be found here. You need to root your Galaxy S8 if you want to take android app data backup. Another option you can find here is the 'Backup' and 'Restore'. With the 'Backup' feature you can backup the entire data of your Galaxy S8 in just one-click. This backup includes photos, videos, music, contacts, calendars, call logs, messages, apps and app data (requires root). The best android manager for Samsung Galaxy S8. Lets you easily manage large amounts of data stored on your Galaxy S8 or any other android smartphone. Provides one-click backup, one-click restore and one-click root functionalities. Easily rebuilds iTunes library from your android phone's data. It is the all in one manager for photos, videos, music, contacts, android apps and their data. Lets you make GIF from photos and videos. Easily transfer data from your old Galaxy phone to your new Galaxy S8 with phone to phone transfer feature. It is a paid software. To use its full functions you have to use it. The free version is useless because you can't use its full functions. But Wondershare TunesGo is worth your money. The iTunes library rebuilding may not come out as a success if you do not have the required data available on your android phone. If you have just bought a Samsung Galaxy S8 or Galaxy S8+ then Wondershare TunesGo can be a must have tool for your phone. If you click photos, shoot videos or store large amounts of data on your Galaxy S8 then you are definitely going to need an android manager. And the best choice is the Wondershare TunesGo which lets you manage all the data of your phone at just one place. With this android manager it is quite easy to manage data on any android smartphone. If you use Wondershare TunesGo then you will never face problems related to data loss or duplicate files. 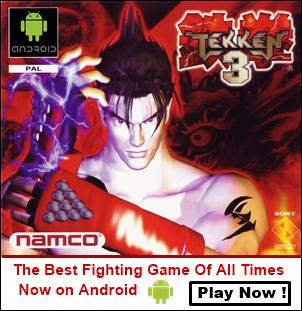 It is your prime decision whether to buy this software or not after using the trial version. So if you are uninstalling this then you should remove it completely. To completely remove this software from your PC just uninstall it from the control panel and remove its registry entries by using a PC cleaner software. On your android go to 'Developer options' and 'Revoke USB debugging authorizations'. Turn off the 'USB debugging' mode on your phone and also turn off the 'Developer options'. An app is installed on your Galaxy S8 by this software called the 'TunesGo connector'. Go to 'Settings>Apps' and uninstall this app if you are not using this software again. Below is the complete list of prices of its different software versions that comes with additional PC support and lifetime licenses. So if you are having a Galaxy S8 or any other android phone then you can go for the android device lifetime license that only costs $39.95 and is totally worth your money. So, this is a review of the Wondershare TunesGo the best android manager for Galaxy S8. If you liked the article then please share it.